Adair County is a county located in the U.S. state of Kentucky. As of the 2010 census, the population was 18,656. Its county seat is Columbia. 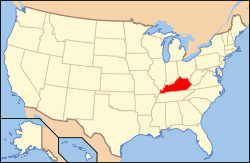 The county was founded in 1801 and named for John Adair, then Speaker of the House in Kentucky and later Governor of Kentucky (1820 - 1824). Adair County is a wet county as of March 23, 2016. Adair County was formed on December 11, 1801 from sections of Green County. 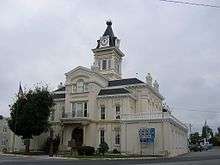 Columbia was chosen as the county seat the following year and the first courthouse was built in 1806. In the county the population was spread out with 23.50% under the age of 18, 10.70% from 18 to 24, 27.70% from 25 to 44, 23.40% from 45 to 64, and 14.60% who were 65 years of age or older. The median age was 37 years. For every 100 females there were 94.00 males. For every 100 females age 18 and over, there were 91.60 males. 1 2 "State & County QuickFacts". United States Census Bureau. Retrieved August 11, 2014. ↑ "Find a County". National Association of Counties. Archived from the original on May 31, 2011. Retrieved June 6, 2011. 1 2 3 4 Adair County Government (2007-06-06). "Kentucky: Adair County - Overview". 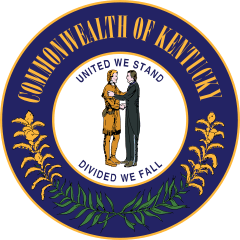 Commonwealth of Kentucky. Retrieved 2011-11-10. ↑ "State's largest historic Chestnut tree stands on an Adair County farm. ", Columbia Magazine, 17 June 2005; Retrieved October 5, 2015. ↑ Flavell, John. "American tale: Bringing back the perfect tree. ", Daily Independent, 24 July 2009. ↑ William A. Settle, Jr., Jesse James Was His Name 44 (1977). ↑ Hogan, Roseann Reinemuth (1992). Kentucky Ancestry: A Guide to Genealogical and Historical Research. Ancestry Publishing. p. 185. Retrieved 26 July 2013. ↑ "2010 Census Gazetteer Files". United States Census Bureau. August 22, 2012. Retrieved August 11, 2014. ↑ "County Totals Dataset: Population, Population Change and Estimated Components of Population Change: April 1, 2010 to July 1, 2015". Retrieved July 2, 2016. ↑ "U.S. Decennial Census". United States Census Bureau. Archived from the original on May 11, 2015. Retrieved August 11, 2014. ↑ "Historical Census Browser". University of Virginia Library. Retrieved August 11, 2014. ↑ "Population of Counties by Decennial Census: 1900 to 1990". United States Census Bureau. Retrieved August 11, 2014. ↑ "Census 2000 PHC-T-4. Ranking Tables for Counties: 1990 and 2000" (PDF). United States Census Bureau. Retrieved August 11, 2014. ↑ Education, Kentucky Department of (2008-12-12). "County & Independent School Districts" (PDF). Kentucky Department of Education. Archived from the original (PDF) on 2010-01-10. Retrieved 2009-12-20. ↑ Adair County Schools (2009-12-05). "ADAIR COUNTY SCHOOLS". Adair County Schools. Archived from the original on 7 January 2010. Retrieved 2009-12-20. ↑ Adair County Primary Center (2009-12-15). "CWC Home Page". Colonel William Casey Elementary School. Archived from the original on 23 January 2010. Retrieved 2009-12-20. ↑ Adair County Elementary School. "Adair County Elementary School". Adair County Elementary School. Archived from the original on 7 January 2010. Retrieved 2009-12-20. ↑ Adair County Middle School. "Untitled Document". Adair County Middle School. Archived from the original on 23 January 2010. Retrieved 2009-12-20. ↑ Adair County High School. "Adair County High School - Columbia, Kentucky". Adair County High School. Archived from the original on 18 December 2009. Retrieved 2009-12-20. ↑ Who Was Who in America, Historical Volume, 1607-1896. Chicago: Marquis Who's Who. 1967. ↑ Western Kentucky University (2011). "Coach E.A. Diddle". Western Kentucky University. Retrieved 2011-11-10. ↑ Marine Corps Scholarship Foundation (2011). "Life - Dakota Meyer - Honoring Marines by Educating Their Children". Marine Corps Scholarship Foundation. Retrieved 2011-11-10. ↑ IMDb.com, Inc. (2011). "Evelyn West - IMDb". IMDb.com, Inc. Retrieved 2011-11-10. Kleber, John E. (1992). "Adair County". In John E. Kleber. The Kentucky Encyclopedia. Associate editors: Thomas D. Clark, Lowell H. Harrison, and James C. Klotter. Lexington, Kentucky: The University Press of Kentucky. ISBN 0-8131-1772-0. Retrieved 2011-02-11.